The Cheerleading Worldchampionship is over. The Athletes are back at home. If you want to see the show again, you can use the recorded livestream of both days til January 19th. Finnally the CWC starts. Pictures of Day One including the opening Cermeony. One day of the rehearsal each team can present its program to the jury. on the Live-Page the player is still embedded. 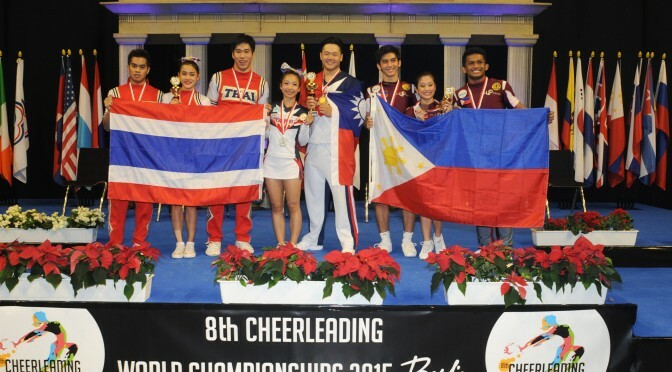 Hosting a World Championship connects to special hopes for the home team, that is no different with the 8th IFC Cheerleading World Championship on 21 and 22 November in Berlin’s Max-Schmeling-Halle. Germany did not win gold before, but took home three silver medals from Bangkok in 2013, more medals than ever before in a CWC. 14 teams compete for Germany this year, the host nation is involved in each of the ten championship categories. In Cheerleading Doubles „Ka-Ja“ from TV Zell at 12:15 p.m. (all times refer to Saturday’s starting order, on Sunday teams will compete according to the reverse order of their Saturday scores) will start Germany’s quest for medals. Team Germany 1 is to follow in the same category at 12:50: a pair representing Firestorm from Bremen. Northern German cheerleaders are also the starters for the hosts in the first competition in Cheerleading Junior and fpr Cheerleading Small Groups: The 1. Hannoverscher Cheerleader Verein at 13:05 has the the honor kick off the first-ever Junior competition in an IFC Cheer World Championship. At 13:35 the Berlin Adler are first to perform in the Cheerleading Small Groups All Female category, followed by another team from Hannover at 13:42. In Cheerleading Small Groups Mixed Dynamo Rostock (14:35) and Stern Britz from Berlin (14:37) enter the mat back to back. In Cheerdancing it is also a German side opening up the first-ever Junior World Chamcpionships, when the Junior Doubles of SC Unterbach performs at 14:57. In the adult’s competition a pair of United Cheer Sports Dortmund will represent Germany at 15:24. Dance Deluxe from TSV Rudow/Berlin is Germany’s trump for the Cheer Dance competition of larger groups: at 15:50 the junior team performs, at 16:00 the senior team – just ahead of defending champion Russia. When the dance floor again has transformed to a cheerleading mat, the large cheerleading groups will enter the arena. The All Female team „The Wild Bunch“ from TSG Weinheim will be the last starter in their competition at 17:05. The two German Mixed teams were drawn for early spots in the starting order: at 17:20 it is the turn of Bremen Firebirds, immediately followed at 17:25 by a regional all-star team of Berlin, Brandenburg and Saxony. At the very end there will be the performance of defending champion Japan. All German teams would be only too happy if they themselves could perform as late as possible on Sunday. Because this would indicate many scoring points had been gathered on Saturday and medal chances would rise. More than 80 performances will combine to six hours of elite cheerleading and cheerdance on each day of the competition. Berlin’s Max-Schmeling-Halle on 21 and 22 November will feature a full schedule with only little breaks. Tickets are on sale at Gegenbauer Ticketservice and should also still be available at the venue’s box office. And of course nowhere else than inside the arena the special atmosphere of a Cheerleading World Championship will be as intense as it can get. Which is obvious, as this is what cheerleading is about in the first place: to interact with the crowds in the stands and get everybody off their seats. Cheerleading as a competition – how does that work? Of course for World Championships – and the various regional, national and continental championships through which the teams had to make their way to Berlin – there are precise rules and regulations. Five judges will evaluate difficulty and perfection in execution of each and every team, and they will punish any error with point deductions. It will need a superior performance to conquer one of a total of ten world titles awarded on 21 and 22 November in the Max-Schmeling-Halle in Berlin. In cheerleading as a minimum a cheer and a „sideline chant“, are compulsatory, and at least one „stunt“ and a pyramid. Cheers are chants that aim to inspire the audience of yelling certain words with the cheerleaders, „sidelines“ are shorter cheers, to be repeated several times. In „stunts“ (acrobatic elements like lifting or throwing other team members, jumps, partly onto the shoulders of another cheerleader) or human pyramids a clear difference will be visible in competition cheerleading versus the usual cheerleading performances on the sidelines of other sports. Safety above all, of course, each team has to provide own staff to cover, especially in small groups or the doubles, all involved in those stunt elements. Especially in the competition of the larger groups music, dance, the creative combination of compulsory elements to a harmonious performance and also many tumbling are of high priority. Teams that emphasize the dance elements and jumps have their own Cheerdance categories for championships. Here it is a variety of different jumps and dance figures taht have to be performed, on the other hand cheers, chants and tumbling are not allowed here, and certainly no stunts or pyramids. The starting order for Saturday has been determined by a random draw, starting times on Sunday in the second round will be according the reverse order of Saturday’s scores. Who performed best on the first day, on the second day will feel added pressure, due to the the longest wait for the own performance, in which concentration has to be upheld. So overall, this is how cheerleading will guarantee plenty of dramatic and exciting competition.